Future'sresearch-based, comprehensive curriculum empowers learners with the academic, workplace, and media literacy skills they need to get ahead. 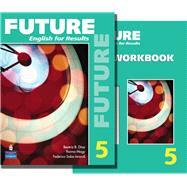 Future prepares students with 21st century skills,helping them transition to further education or career training. Student book with Interactive Practice Plus CD-ROMenables learners to persist by providing multiple pathways to learning. Built-in multilevel instructionensures the success of every student. Components include: Student Book with Practice Plus CD-ROM Workbook Audio Program Tests and Test Prep with ExamView Teacher's Edition and Lesson Planner Professional Development DVD The Practice Plus CD-ROMincluded with the Student Book is an extraordinary tool for individualizing instruction. It allows students to direct their own learning, working on precisely what they need and practicing what they choose to work on as many times as they like. In addition, the CD-ROM provides all the audio files for the book, enabling students to listen as they wish to any of the material that accompanies the text. Futureis a six-level, four-skills course that empowers learners with the academic and workplace skills they need to get ahead by helping them transition to further education or career training.